Here’s a shared spreadsheet that highlights a few tournament plays we are interested in for Friday’s Preseason Week 1 two-game slate. The names on the list should be mixed and matched with other players you like. Some of the suggestions are off-the-board and represent high-variance plays because the only way to win on such short slates is to hit on a few of these types of plays. Congratulations to all who won money yesterday on the main slate, including RW listener @sportzfanlr81 who took down the $20K first prize in the big $8 entry tournament with the help of these tools. Click here to go to the shared spreadsheet. Do you guys think there will be an update to the standard cheat sheet this morning? Yes, will be up in about 2 hours. Just bump the RBs up a tad and you’ll be good. Obv take Guice and Cain off. ADP’s have tightened in last 48 hours of preseason action in the book, so making the proper adjustments. Flip Mixon w/ Howard. You should be pretty good. Just watch the WR going a little heavy under old ADPs on V2.0. User your discretion. 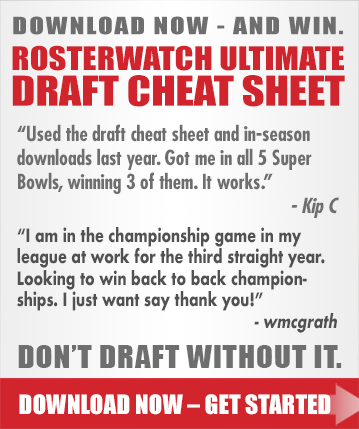 If the old sheet is telling you to take either 4 RBs or WRs by RD5, then you will need to make an executive decision to balance the roster on the fly with the next highest player on the sheet from the position group you are needing. I have a keeper question. 1PPR, we can if we want to keep 2 players the cost is a 1st & 2nd rd picks. Looking at other team rosters, it is my belief that 4 people will keep players. The spots and the players that I believe will be kept are as follows; 1.07(Hopkins), 1.08(Kamara my keeper), 1.09(K Hunt), 1.10(Gurley). No my question thanks to the magical, mystical cheatsheet last year I will be picking 2.05 and can choose from either K Allen or D Cook. Your updated PPR version 3.2 have both players as a pick em. The ADPs have them within a couple of picks away from each other. My thinking is Allen will see a slight uptick in targets around 2-3 per game, because of Henry’s injury. Cook is coming off an ACL from last year but has look good on cutting away from players. If i keep Allen I start off with a balanced going into round 3. However, WR are deeper than RB this year. Mocking I been able to garner Hilton, Evans and even Diggs as a WR1. So I am asking you your opinion, 1 who would you take and why. I need to have these keepers by Monday. Can’t go wrong either way. When there is a tie, we like using roster balance as a way to split the hairs. We love KA. Only issue I see- is this is so early in the draft that you don’t really know that your roster is unbalanced yet by taking 2 RBs there. Like you say tons of WR we like later. Huge massive upside for Dalvin. I’d go look at both their SOS on the downloads page for the early season fast starts. In a vacuum I think I roll the dice I personally live life on the edge with Dalvin. Thank you Adam, for the help and lets go RosterWatch Nation! I’m doing a 10 team 2 qb Standard auction league.. does the value of QBs differ from what’s on the sheet? use the superflex/2QB sheet and youre golden! I’m picking 3rd overall in a 10team .5ppr keeper that starts 2QB, 2RB, 3WR, 1 flex. My keeper is Lev Bell. Notable players not kept include: Antonio Brown, D Johnson, A Rodgers, M Gordon, Hunt, Cook, K Allen, M Thomas and Barkley. Looking at your V2.0 2QB cheat sheet I should go DJ, Rodgers or Brown/Barkley. Knowing that I draft 3rd, and it’s 2QBs .5ppr, would you rank them that way? Again, I already have Bell. Thank you! that is exactly how we would. good luck brother. Good morning crew. Wasn’t able to call in during yesterday’s show, so I’ll ask here. I have the 3rd overall pick, 10 man 1/2 pt ppr. I have the option of either keeping Joe Mixon with my 4th round pick, Brandon Cooks with my 5th round, or keep no one at all since I’m not required to keep anyone. I was leaning towards Cooks. But Mixon in the 4th seems more of a better deal, since I still might be able to get Cooks in the 5th round regardless. Pending injuries to other WR’s. In a redraft .5 ppr auction draft which RB would you target if values follow the cheatsheet? I have a good feeling about Fournette this year (run heavy, great oline, great defense). I know going in to an auction draft with too many targets is a good way to overspend but when it comes to the elite talent I feel like getting your guy is important. I think you can be fairly liberal with rbs this season, as wr and te are considerably deep. Hunt is probably the last guy i go deep on.